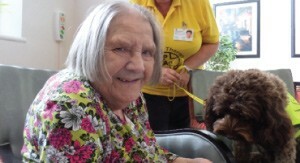 Ellie Litchfield and her dog, Fudge who volunteer with the Pets Are Therapy charity have become regular visitors at Wentworth Court every Tuesday. Ellie, from Bredon has been volunteering with the charity for around eight months. Before meeting residents, Fudge was assessed for her temperament and her ability to be handled by strangers.